A Michigan City, Indiana French Bulldog named Stu is being credited with possibly saving the lives of his entire family. Tim says their daughter’s dog, Stu, a French bulldog, may have saved the entire family’s life last weekend. In the wee hours of last Sunday, the family, Tim and Mary Kay, daughter and son-in-law Kellie and Matt Duncan and their 3-month-old daughter, Nora, were taken by ambulances to St. Anthony Memorial, victims of carbon-monoxide poisoning. Were it not for Stu, Tim fears, the family might not have lived to take those ambulance rides. The family gathered last Saturday evening for a party at the home of Mary Kay’s dad and his wife, Jim and Melinda Kintzele. After the party, the Duncans, who live in Valparaiso, decided to spend the night with the Mark family. Early Sunday, Mary Kay awoke feeling ill. Then, Tim heard Stu whining in his nighttime crate. Tim took Stu and his own two Shar-Peis out, and when he came back to the house, he sat up for a while because he was suffering a serious headache. As his headache worsened, he began to think about Mary Kay, who had some nausea as well as a headache. Putting the two symptoms together, he harkened back to a time when he had some first-responder training … and carbon monoxide poisoning came to his mind. He called 911 and got everyone out of the house. Kellie collapsed briefly, but everyone gathered in the garage with the garage door open. Kellie and Mary Kay were bundled in blankets on the garage floor. 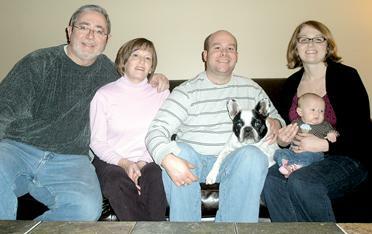 The dogs — Stu and the two Shar-Peis — were taken to the backyard and later cared for by other family members. Mary Kay Mark, an academic adviser at Marquette High School, and Tim, who works in service engineering for Whirlpool, both still have some fatigue. “And Mary Kay still has some burning in her lungs,” Tim said. Before Sailor gets any ideas – I STILL plan to yell at you if you wake me up at 4 am, young lady.